The tyristor rectifiers marked SIR-T x/yy are multy purpose rectifiers - for charging of electronic and telecommunication equipment and as battery chargers.Based on their power, the rectifiers are placed in aluminium UNI boxes or in plastic metal lockers with an IP54 protection. The equipment is made with full voltage and electric connection, and the current values are shown with digital instruments. They are made as mono phased or three phased. The impulse rectifiers with a general marking of SI-REC ХХ are electronical SMPS (Switch Mode Power Supply ) rectifiers. 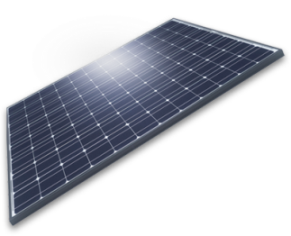 they are used to charge equipment with large variations of the grid voltage. They are designed to charge input voltages of 145- 265 V, and accepts both the frequencies used in the rail traffic - 50 Hz and 83,3 Hz. The Rectifiers are made for output voltages of 12, 18, 21 or 24 V and otput currents of 5- 12 A. The electronic is placed in an alluminium box that also serves as a cooler. In every rectifiers there is a temperature controlled fan for additional forced cooling. 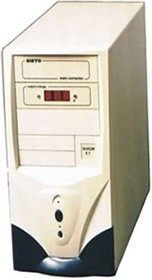 The uninterruptible power supply (UPS) is made for continual charging of electronic users where there must not be a power loss. They are made for work in off and on regime, with power of 0,5 - 120 KVA. The off line UPS' are with a transfer time of less than 2 ms, an interactive working regime, mounted voltage corrector (to 187 V) and clean sinus output voltage. The normal working autonomy under battery regime is 7/22 min. The autonomy can be increased to 10 h with the mounting of external batteries and appropriate automatics. 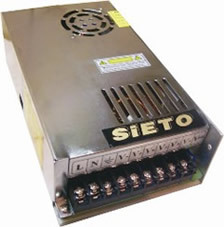 The DC regulators with a general mark SIETO REG, are made for the regulation of the number of spins at the DC motors. They can work in a one, two, three and four quadrant regime. The return information for the speed of the electromotor is get by a taho-generator. The speed is given by a potentiometer. They are made for powers of 0,5 - 100KW.The main switch can be mono phase and three phase. The output block is a tyristor regulated bridge (monophase or three phase). The frequent regulators are made for the regulation of the speed for the asynchrony electro motors. Depending on the series, they are made for powers in class to 2,2KV, to 30KV and to 100KV. The regulators are digital with a processor controlled electronics. On the front panel there is a regulation console with a LCD display where the frequency, voltage, power, overload etc. can be read. The can be given with a potentiometer, power source or a RS 232 protocol. The output block is made of transistor IGBT modules. The regulators are made for montage in a locker.